On this day in 1944 the Nazi occupation of Serbia ended. And although fighting would continue for several weeks as the retreating axis forces were driven from Croatia and Slovenia, it was on October 27th 1944 that Germany’s “Army Section Serbia” was disbanded having been comprehensively defeated by Tito’s Partisans. It was quite an achievement. While in other occupied countries the resistance movements provided vital support to the allied forces who drove out the fascist troops, in Yugoslavia it was the other way around… the Proletarian Brigades overthrew the occupying army with the support of the allies. Josip Broz (“Tito”) first became involved in revolutionary politics at the tender age of 17. He joined the metal-workers union in 1910 and became a member of the Social-Democratic Party; neither of which endeared him to the Austro-Hungarian authorities which controlled much of the Balkans. Nonetheless with the outbreak of World War One, Tito was conscripted into the army of the empire he viewed as The Oppressor. It was the first of many contradictions that would define his life. Sent to fight on the Russian front, he emerged as a uniquely gifted battlefield tactician and became the youngest Sergeant Major in the history of the Empire. Yet he also spent several months in a military prison for distributing anti-war propaganda. Sent back to the front after his sentence, Tito was badly wounded by Tsarist forces and captured. He spent a year in a Russian prison camp where — upon recovery from injury — he was elected camp leader. Under his guidance and with help from local Bolsheviks, the prisoners revolted resulting in a mass escape. Tito hooked up with the Bolsheviks and took part in the Russian Revolution of 1917. Soon afterwards, having helped Russia rid themselves of aristocracy, he returned to the Kingdom of Yugoslavia to do the same; quickly becoming a leading light in the Communist Party. But it would be over two decades before his time would come. Surviving Stalinist purges of the Comintern, he also found himself an outlaw as the Yugoslav authorities tried to stamp out the Communists. When they eventually captured Tito and sentenced him to 5 years in prison, it proved to be a turning point. During his five years in Lepoglava prison he met his close friend and mentor, Moša Pijade, a painter and activist who had landed himself in jail for translating Das Kapital into Serbo-Croatian. 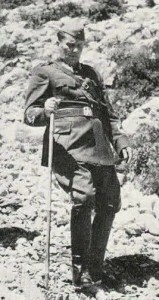 Thanks to Pijade, by the time of Tito’s release he’d transformed from an eager but unfocussed revolutionary to a leader of men. And when Hitler made Yugoslavia part of the Third Reich in 1941, this talented battlefield tactician — now with a revolutionary education and the wisdom of experience — was ready to take his place in history. He was quickly appointed Commander in Chief of the resistance, and formed the Proletarian Brigades. Drawing initially on communists and union members, his charisma and reputation for strength and fairness quickly swelled the ranks of the Partisans. They took to the mountains along the border between Serbia and Montenegro and became arguably the most successful of the national resistance movements. Even at the height of German power, Tito’s Partisans maintained control over much of western Serbia and Bosnia. He created the Anti-Fascist Council of National Liberation of Yugoslavia which created “People’s Committees” to act as civilian government in the areas he liberated. By the beginning of 1944, the elimination of Tito’s Partisans had become a priority of the Third Reich. Using guerrilla warfare the Proletarian Brigades had taken a terrible toll on the fascist forces and the Balkans began to look like a weak point in Germany’s defences. Rumours of an allied invasion in the area made this all the more urgent, and for a time Tito was Hitler’s Public Enemy No.1. Describing himself as a “pragmatic idealist”, Tito realised that his best bet was to solicit the support both of the western allies and the Soviet Union. He knew that if he relied on just one of them, a liberated Yugoslavia would be in danger of falling under their influence. And despite being a communist, he had no intention of trading a German Empire for a Soviet one. What was remarkable, was just how successful he was in this aim. In 1944, both the western powers and the Soviets officially recognised Tito as the legitimate leader of a Yugoslav Republic Under Occupation. Despite unfinished business with the Nazis, the aim of ridding the country of the aristocracy had been achieved. He signed a treaty with Stalin allowing Soviet forces to temporarily enter Yugoslavia and with Churchill permitting the advance of allied troops along the Adriatic Coast. Receiving supplies and logistical support from both west and east, he led his forces down from the mountains and took the cities. The ferocity of the Partisans became legendary as they advanced in their war of liberation. Street to street, house to house, the Proletarian Brigades pushed the fascists northwards along the Danube, taking only 8 days from their arrival in Belgrade to hoist the Red Star above the city. Eventually the Germans realised that Yugoslavia was a lost cause and withdrew their forces into Hungary, at which point Tito advised Stalin that the Red Army had better follow them across the border lest they find themselves the next target of the Partisans. It was a brave move and one that ensured Stalin never gained the sort of control over Yugoslavia that he did over the other Eastern Bloc countries. Later, sadly, as the power went to his head, Tito’s revolutionary ideals hardened into totalitarianism. Certainly nothing like as oppressive as other nations in Eastern Europe, but nor was it the socialist utopia he had dreamed of during his years in Lepoglava prison. “Liberal institutions cease to be liberal as soon as they are attained: later on, there are no worse and no more thorough injurers of freedom than liberal institutions”. Perhaps the same might be said for revolutionary institutions. I couldn’t agree more on your reservations concerning institutions and corruptive power of leadership. Even now, with the whole testing ground of 20th century and innumerable object lessons on the topic, we still seem unable to embrace the clear ideals of Kropotkin, Bakunin and other beautiful minds of yore. But despite that, I try to remain optimistic. The examples of project Wiki, Wikileaks, Occupy movement, Anonymous and last but not least – On This Deity – even if widely controversial and disparate in their merits, are hopeful glimpses of inevitable changes to come. Great piece by the way 🙂 and illuminatingly apt quotations. Thank you! Agree. Very good article. Of late have been reading at length re Yugoslavia between 1940 – 45. This has filled in quite a few chronological/biographical gaps on Tito himself … so, my thanks. It is worth noting that when Belgrade was liberated in October 1944 by a combined Red Army/partisan operation, the latter encountered “not one – literally not one – member of the party. There were thousands of sympathizers, even wildcat non-party groups, but the party members had been wiped out in camps, in gas extermination trucks and on execution grounds. At the execution ground in Jajinici night after night – every night in the course of three and a half years – hundreds of hostages and patriots, mostly communists and sympathizers, were executed ….” (Djilas ‘Wartime with Tito & the Partisans,” 1977) from Gluckstein’s A PEOPLES HISTORY OF THE SECOND WORLD WAR., 2010, p.30. Further, Mihailovich is reported to have said: “His main enemies were the partisans, Ustasha, Muslim and Croats – in that order – and only when he had dealt with them would he turn his attention to the Germans and Italians. This policy was confirmed in chetnik practice ….” (See same sources as above).